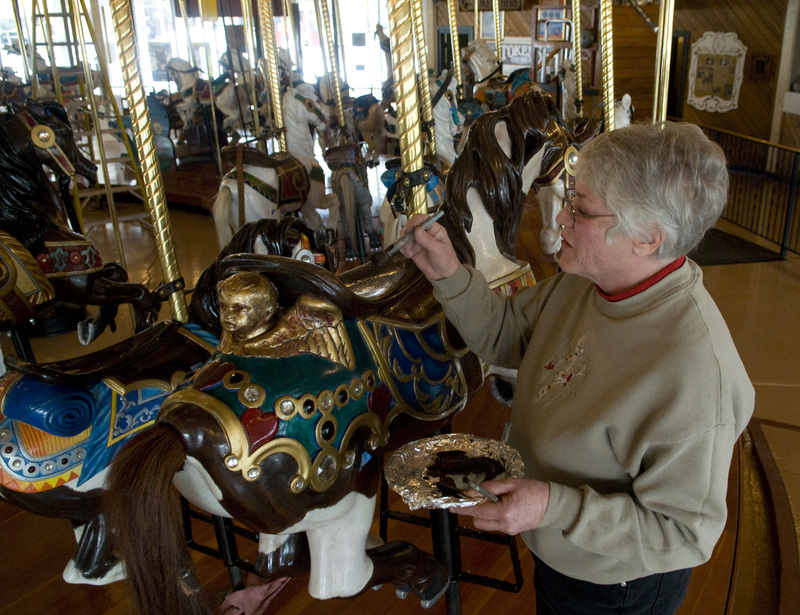 The Looff Carrousel will reopen on Feb. 27. Events celebrating the 100th birthday will be scheduled throughout the year, including a special celebration on July 18, the Carrousel’s true birthday. For more information visit http://spokanecarrousel.org or www.spokaneparks.org. For several weeks the ponies have patiently waited. They’ve been stoic when little noses pressed against the glass and looked longingly at them. Meanwhile, in the silence of the Carrousel building they’ve submitted to the tender, loving touch of Bette Largent, president of the National Carousel Association, and restoration expert. Their ears have been touched up, their saddles painted, their stirrups polished and some of their tails replaced. In addition, each horse’s shoes received a fresh coat of silver paint. “My dad used to say, ‘You can’t go out unless your shoes are polished,’ ” Largent said with a grin. All this sprucing up is in preparation for the Feb. 27 reopening of the Looff Carrousel and a yearlong celebration of the Spokane icon’s 100th birthday. According to Largent, the Carrousel was created as a wedding gift for Looff’s daughter, Emma. While originally located in Natatorium Park, the Carrousel has been at its present location since 1975. Each patch of faded paint tells a story, and Largent, who’s cared for the Carrousel for 17 years, knows most of them. She pointed to the worn paint on Gerry Giraffe’s ears. “Little kids grab his ears to steer him.” She can discern which figure is most popular with certain age groups by the height at which the paint has been worn away. As Largent walked around the Carrousel a gray mare caught her eye. “This is Miss Lilac,” she said. “We can’t look her in the mouth – she’s our gift horse.” The “Miss” in Miss Lilac stands for Missoula. “We helped them with their carousel,” Largent said. The bejeweled gray pony was a thank-you gift. This former librarian is still discovering new things about the beloved landmark and its creator Charles I.D. Looff. One thing involved his name. “I’ve been doing a lot of research with a great-grandson of Looff,” she said. “His name wasn’t Charles; it was Karl Jurgen Detleff Looff.” An immigration clerk’s messy handwriting led to the mix-up. Largent traces her love of carousels to childhood. For her, they’ve always had the tantalizing lure of the forbidden. “My father was very conservative,” she recalled. “He took a dim view of carnival rides.” Her mother, however, loved carousels, and Largent’s earliest merry-go-round memories are of spinning on a ride at a state fair. “We’d wait until Dad got busy at the horse barn – then we’d sneak off. It was the forbidden fruit.” Her brown eyes twinkled at the memory. Recently, after making her circuit around the Carrousel she stopped near the heart of the ride – the 1900s-era band organ. While she’s hoping to convert the music to midi files and incorporate contemporary music (“I want ‘Louie Louie,’ ” she said), Largent acknowledged the band organ with its paper rolls is a treasure. The organ was rebuilt in 1998, but is played only on special occasions because the rolls are deteriorating. Usually, patrons ride the ponies to the tune of recorded band organ music. Contact correspondent Cindy Hval at dchval@juno.com.